Run for your lives! Just kidding, the two 19 year old gorillas that escaped from the Kansas City Zoo have been returned to their cages. On Sunday, February 19th, two full grown gorillas named Ntondo and Mbundi found that the door to their enclosure at the Kansas City Zoo had been left open, allowing them to escape and wander around freely for a short period of time. When it was discovered that the gorillas had escaped from their enclosure, zoo officials and staff rushed zoo patrons into a safe area temporarily while the gorillas were gathered and "guided" back to their enclosure with the use of water hoses. While no one was threatened or injured, news of the gorillas escape sent shock waves throughout the zoo and it's staff and patrons on Sunday. Randy Wisthoff, director of The Kansas City Zoo said that disciplinary measures would be taken once they find out who was responsible for leaving the door open to the gorilla enclosure. An investigation by the United States Department of Agriculture and the American Zoo and Aquarium association will be held as a matter of standard procedure. Since no one was injured or threatened, and the gorillas were quickly contained, the zoo will most likely continue to operate as normal. Ah, there's nothing like a small taste of freedom, and I'm sure that the gorillas Ntondo and Mbundi had a great time for the few minutes that they were out and about at the zoo. I would imagine that it would have been much harder to capture and contain a tiger or a lion, so since it was only 2 full grown and well trained gorillas that escaped on Sunday everyone should consider themselves fortunate in this case. Since most animals in the zoo are very well taken care of and fed, most probably would not even pose much of a threat to humans, unless of course they were provoked, which we at Kansas City News would certainly not attempt! The two gorillas that escaped from The Kansas City Zoo were estimated to have weighed about 400 pounds each. 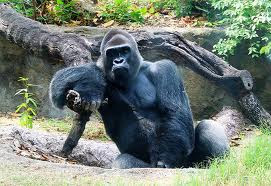 I wonder where in the Kansas City Zoo they quarantined everyone when the gorillas escaped? Hopefully not the fly-infested food court. Although in the KC Zoo's defense, their food is slightly better than World's of Fun.